Sophsterlicious • UK Blog: Photo-a-Day ~ Day two! ~ Weirdo Weather. What is wrong with British weather, seriously? We've had some lovely weather lately and today we're back to cold, cloudy, wet and dull. It's not cool! I'm not a massive sun lover to be honest, but it's nice to have good weather. 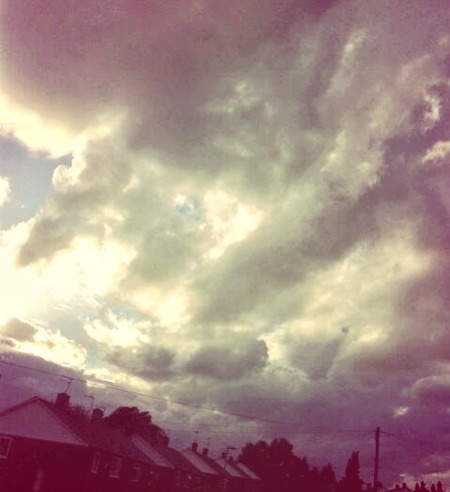 I took this shot out of my window and added a filter, I thought the sky looked quite pretty and magical, even it if it was cloudy and angry! Haha. Weather here is dull and rainy too, so you're not alone! I made the error of going to work in peep toe shoes today = wet feet :( hopefully it gets warmer (and drier) soon!